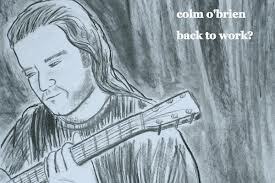 A look at albums we have written about in 2013 – here’s Colm O’Brien and his 2013 release ‘Back to Work?’ taken from Irish Music Magazine. Colm O’Brien has issues. Not his own ones though; he has issues with the current socio-economic climate for the working class Irishman and the plight of the Irish Diaspora, especially in the US. Why am I telling you this? It’s because he articulates these issues with a passion in his latest release Back To Work?. The Boston based Irishman makes full use of his gravelly Dublin lilt whilst giving his own slant on traditional favourites like Belfast Mill and Jackie Hall and then pushes the boundary of passion on his own compositions that push forth his strong views of the plight of the little man. Take The Ballad of Little John, for instance that expounds the hardship of ‘having a mortgage to pay and six mouths to feed, how am I to see to what my family needs’ and where he sings against the Corporation’s greed. The execution is in the song but it’s the passion in the voice that ignites the flame. This flame burns brightly in his spoken word as he brings life to the pervasive imagery described in Vinnie Caprani’s powerfully versed Beginnings. The term passion is used extensively in this review and it’s because the album has passion in abundance. It sounds at home in both the watering holes of Boston where the catchy melodic airs will ensure rhythmic foot tapping and also when attentively listening at home to the stark lyricism and its expressive delivery. Whichever way you decide to play Back to Work? you are guaranteed an entertaining listen.